Thirty four members participated and most were accommodated at the Myrtleford Ski Lodge in Falls Creek. Medium/Hard – Watchbed Creek to Batty’s Hut and to Mt Nelse West and to both Johnson’s and Edmonson’s on the return journey. Two walks were completed by members. Fifteen walkers completed the Easy/Medium graded walk from the end of the dam wall at Rocky Valley dam along the Heathy Track to Edmonson’s Hut and return which was a distance of 10km. The weather was fine, the stroll in the open alpine grasslands was most enjoyable, there were still many alpine flowers and the hut was in good condition. Seventeen walkers tackled the harder walk from Watchbed Creek near Rocky Valley Dam to Batty’s Hut a distance of 19 km. The length of this walk was increased since the track began almost on the Alpine Road rather than 2 km along the Watchbed Creek track. 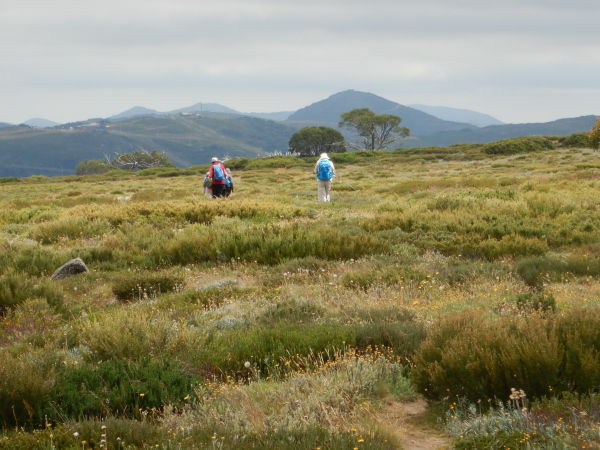 Soon after Mt Nelse was passed the walkers ventured in an easterly direction through alpine grasslands and areas of Snow gum eventually to an open area that showed evidence of past cattle usage. Then the track became overgrown and most difficult to navigate. The main reason the ruin of Batty’s Hut was reached was due to the use of a GPS rather than any other form of navigation as the undergrowth and thick bush was often impenetrable and it meant that long range visibility was impossible. After returning by the same route the return journey along the Big River track was much more pleasant. The Saturday night celebrations included a 50th wedding anniversary and a 70th birthday. One of our stalwart members, Trevor Turnbull, spoke about his involvement with a group of skilled and unskilled volunteers who work with Parks Victoria to restore and renovate nominated huts on the Bogong High Plains. Trevor had many tales to tell of these adventures and the processes involved in rebuilding these often century old structures to their original appearance. This is valuable work which is done to ensure that the history of this high country is not lost down the generations. Being a Total Fife Ban it is club policy not to walk in such conditions. But there were some individual members who continued the Hut theme to visit the iconic Wallace’s and Cope Huts and Trevor was able to explain in details many of the construction procedures that were involved. This short 6 km. 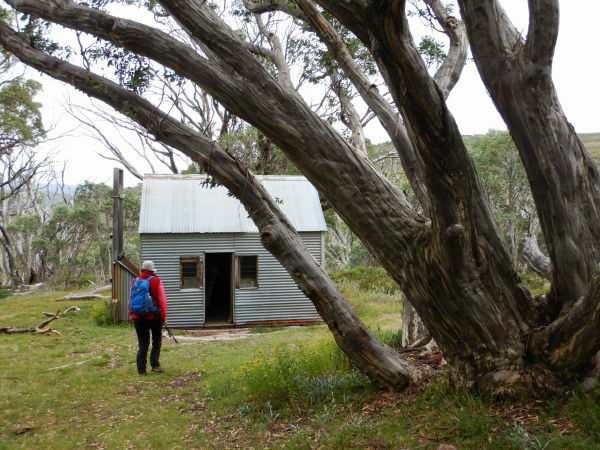 walk also included a tour of the Bogong Rovers Chalet located between the two mentioned huts. The trek included a walk adjacent to the aqueducts that are part of the Kiewa Hydro Scheme as well as being on the Alpine Walking Trail. Thank you to all those who helped organise the accommodation, who assisted with the catering for such a large group and for those who mapped out the walks and acted as walks leaders. As per usual it was very much a team effort.